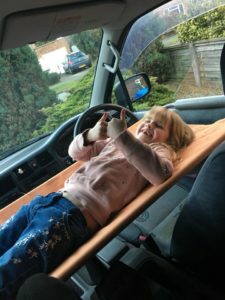 How do people cure lumpy Bongo seat beds? Sometimes, facing in the opposite direction, to the one first tried, is more comfortable. Some people also remove the head rests. Bear in mind, when choosing a solution, you might want to consider the extra storage space required if you carry mattresses that cannot be rolled up, deflated, or folded into smaller sizes. 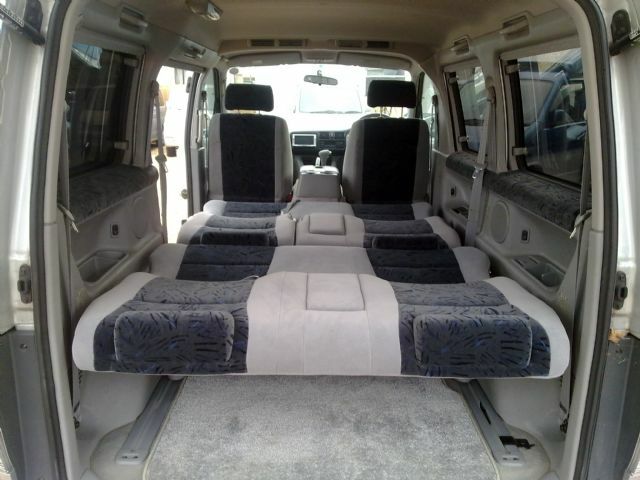 The standard Bongo has two fixed, forward-facing, front seats and two rows of forward-facing, rear seats. 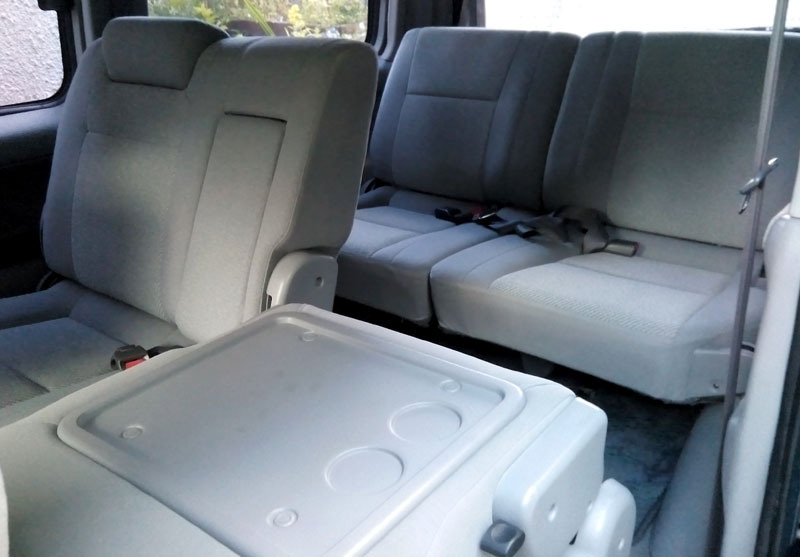 Some models have back seats that fold down and swing up to each side of the van. 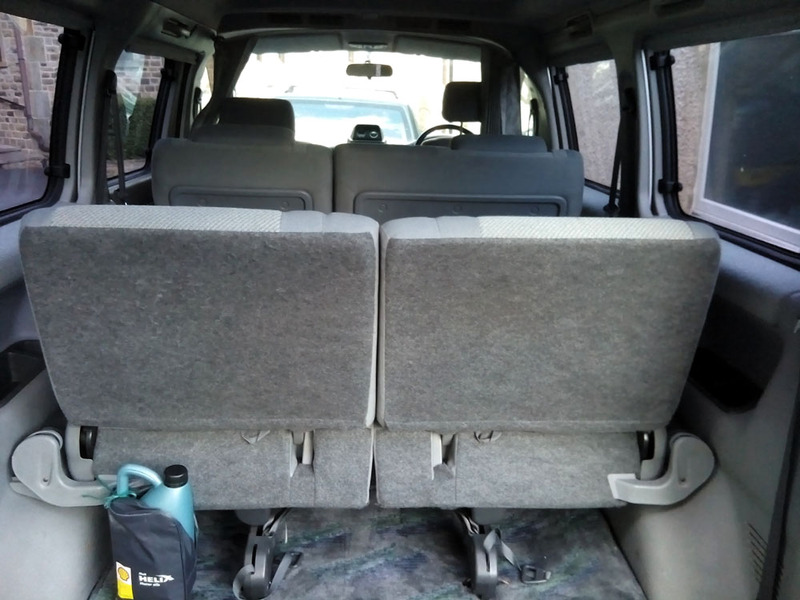 Many owners change these arrangements – for example, turning around the first row of rear seats to permanently face backwards, or installing a rotating conversion, allowing the seat to face front whilst travelling and rear when camping. 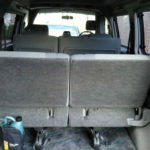 Others convert one or both front seats with rotating devices. You can even get a bunk bed for a child to sleep in the front of your Bongo. 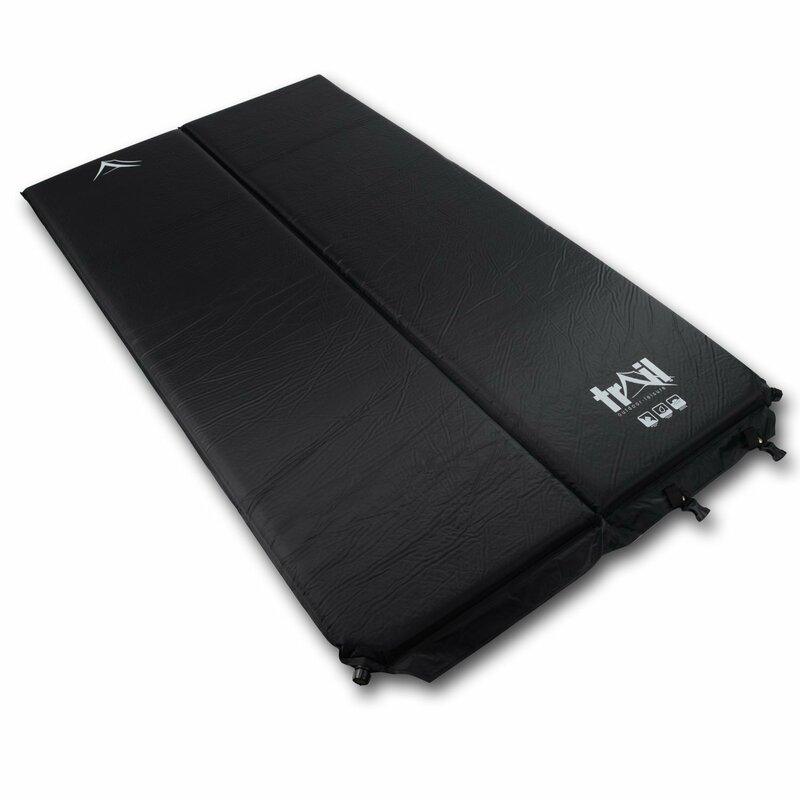 Double Self Inflating Camping Mat Inflatable Sleeping Roll Mattress 5cm. Available from Amazon. 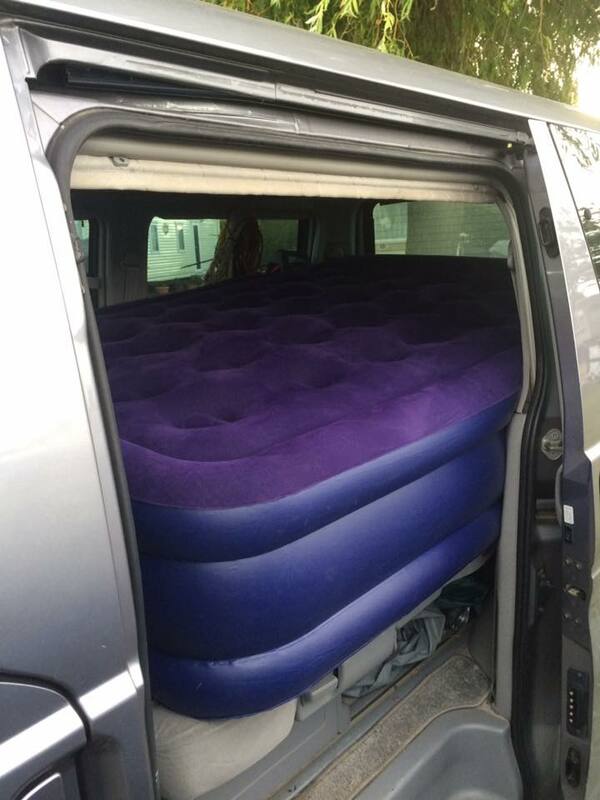 According to one Bongo owner, it’s a perfect fit and when let down, can stay in the AFT when it is closed. 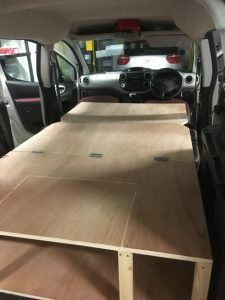 Not fitted in a Bongo, but an example of making a wooden folding bed unit that still allows the seat behind the front seats, to be kept in place. 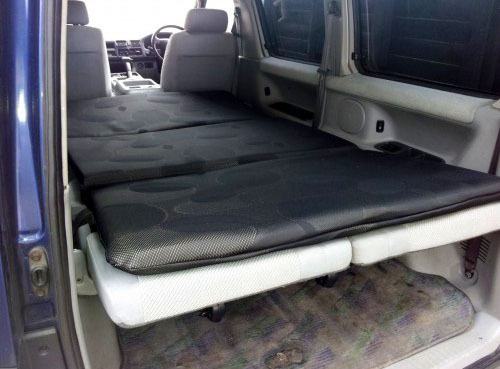 By unfolding over the van’s folded seats, a flat surface is created for a comfortable mattress area. 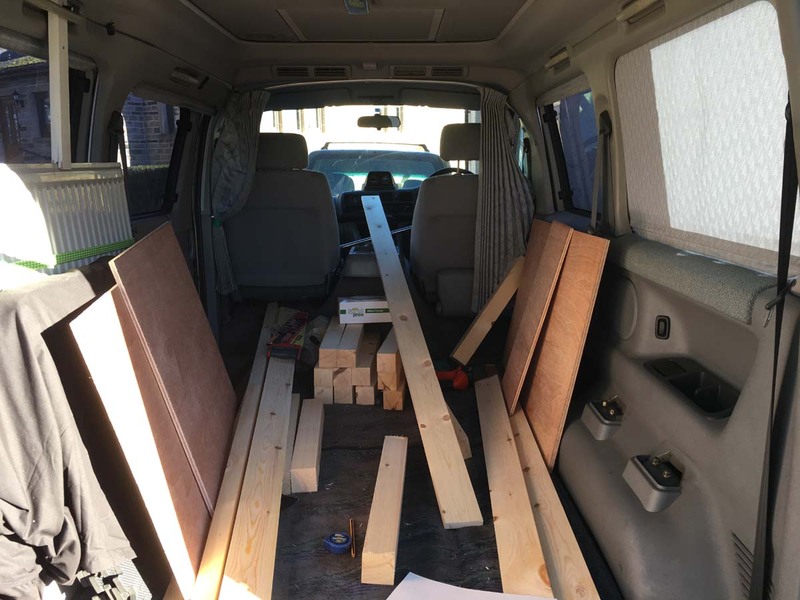 Personally, I have tried a number of ideas for the internal arrangement of my unconverted Bongo. I began with various standard seat arrangements, but soon found that the seats actually got in the way, when not used as a bed. 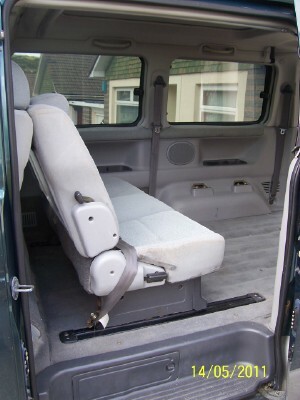 Firstly, I removed the rear split seats; later I removed the main bench seat and replaced one of the rear split seats. 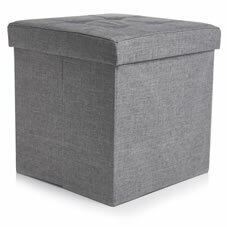 Finally, I removed all of the seats and used several Ottoman, folding storage, boxes (usually available from Wilko for under £20 a double length box, or £12 for a single, cube box). 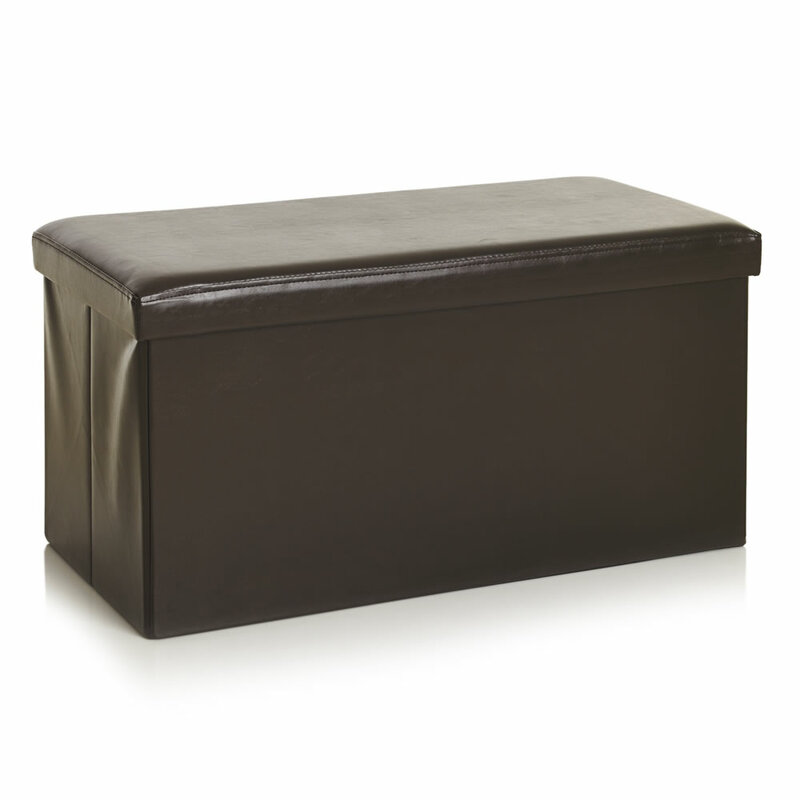 The boxes are fabric-covered thick cardboard, with a top reinforced with a wooden board – strong enough to sit on. 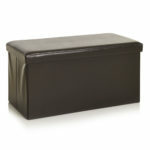 When not being used, the boxes can be folded up flat and stored in their lids. 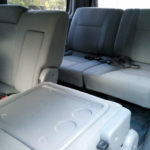 (They are also about the same height as the seats, when they are in bed mode). Although the Ottoman boxes worked fairly well, it was gradually dawning on me, why so many people buy Bongos with conversions – or soon have conversions added. 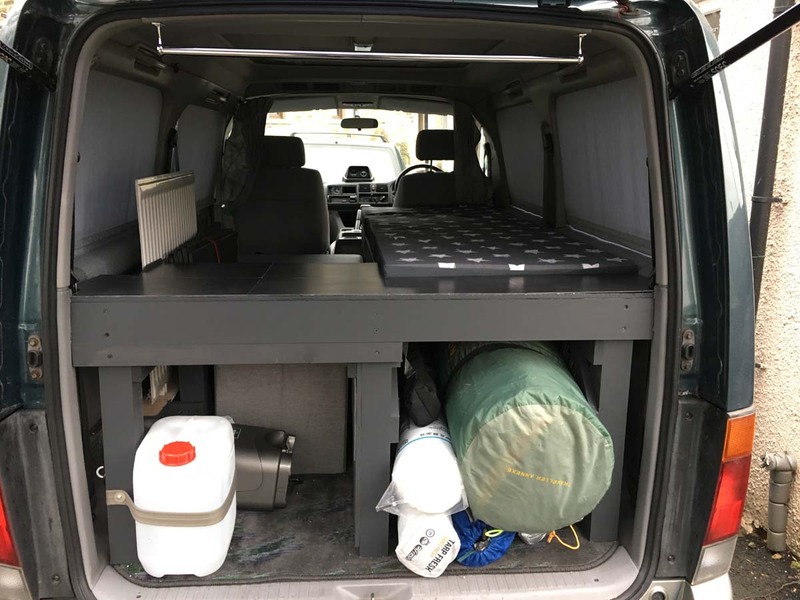 Although I still did not require a fitted sink and hob, I realised that ‘proper’ conversions have to include these items, if you want to change the description of your van with the DVLA and thus reduce insurance costs – around half of normal for a standard MPV. 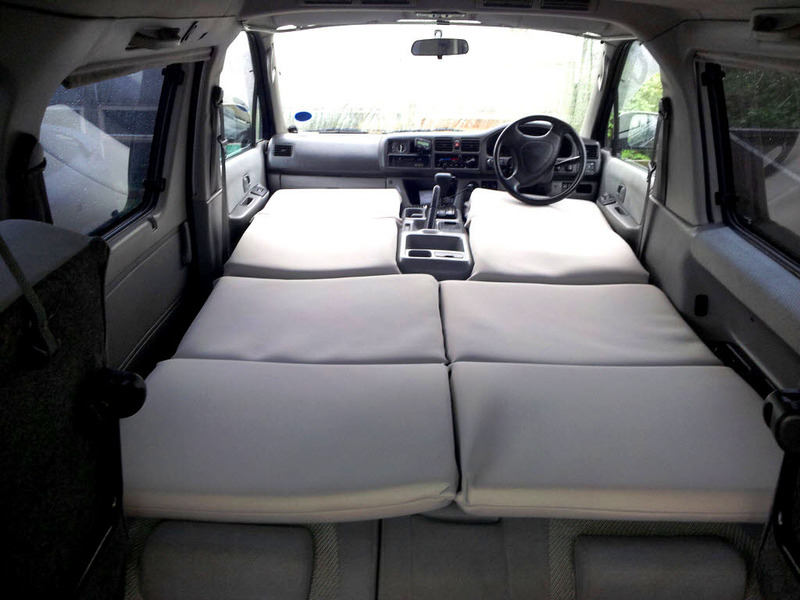 Personally, at this stage, I was happy to keep my Bongo as an MPV, because I may wish to replace the seats to carry people occasionally. So what led me to this arrangement? Because I wanted storage access which would take the Ottoman boxes and a few other items, this resulted in creating a bed height, slightly higher than normal. 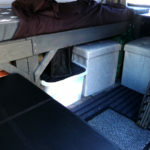 However, this wasn’t a big issue, since the AFT can be raised to increase head space above the bed area. 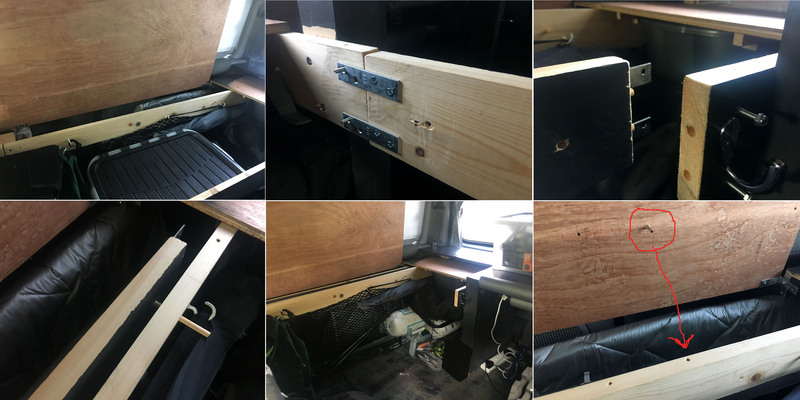 Whilst working, it might be nice to look out on a view – with or without the rear of the van open, depending on weather conditions. Having room to stand whilst changing clothes, removing storage boxes, or swapping wellies for shoes, is useful all of the time. I had a lightweight, oil-filled panel heater. Mounted on a plywood shelf, attached to the fittings of one of the [removed] rear split seats, proved to be a great solution, taking up little space. 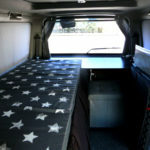 I don’t like to actively attract too much attention to the interior of my van, or anything it may have within it. Therefore, I wanted to keep colours on fixed areas, dark. 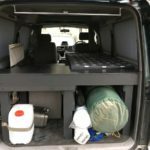 A casual glance from a passer-by in public towns and car parks, would give the appearance that the van was empty or uninteresting. 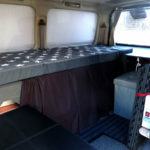 As well as being, like all Bongos, quite old, my van isn’t in the pristine condition of many other Bongo owners and therefore, spending a lot of money on commercial conversions or modular units, isn’t really a viable proposition. Access to the engine, below the front seats, is required at all times. 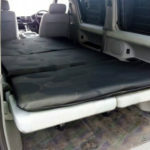 Therefore, you cannot have a bed arrangement that gets in the way of the front seats being swung backwards. 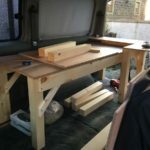 I therefore had to take account of this when building the bed and the front third of the bed slides forwards and pulls out sideways, as a separate module. 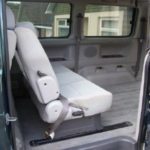 Ability to remove the conversion and return the seats. 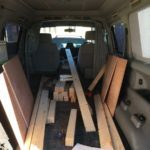 Nothing is fixed to the interior of the van. However, the design is created in such a way, that it is suitably wedged, and will not move around when driving. 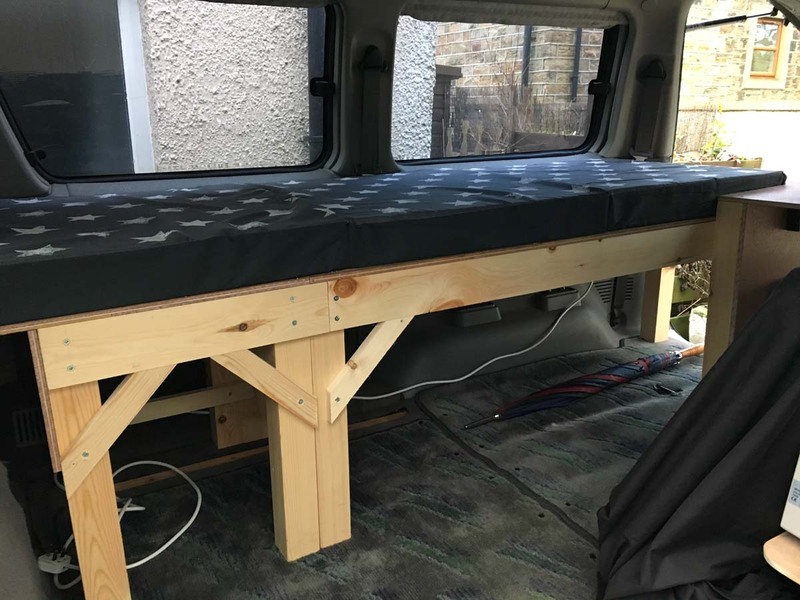 In October 2017, I made a modification to the bed (see last image above). 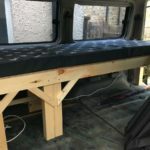 In order to gain more seating area during the daytime, I modified the top and side of the bed. 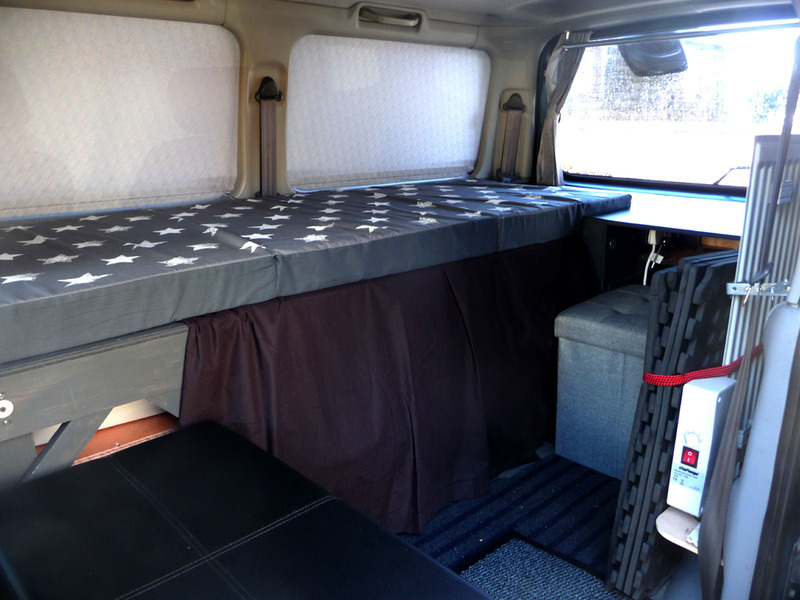 The bed top is now hinged and lifts up to hold under the Bongo’s top grab handle. 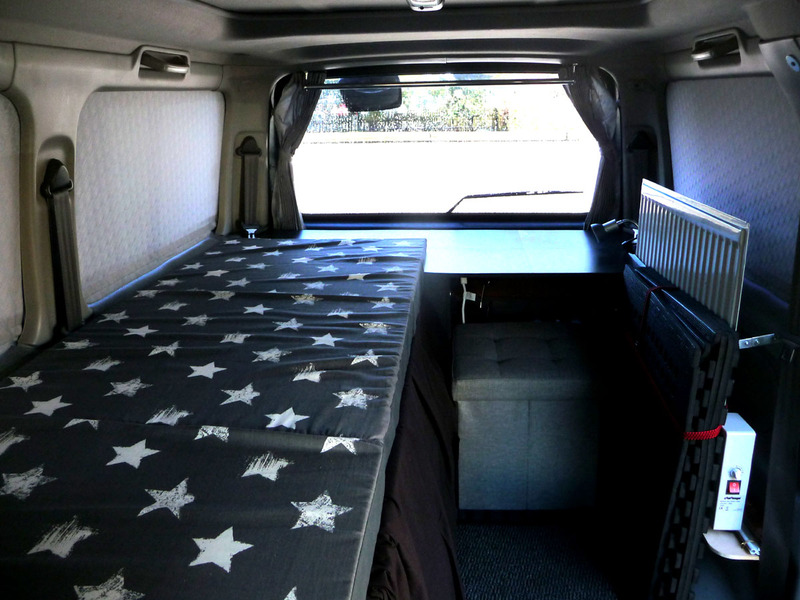 The side can then be removed and placed behind the other side of the bed. 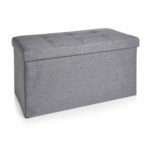 The bed mattress can be folded so that a single section rests on the two square Ottoman boxes (placed side by side to form a seat) and the remaining two folded sections form a back rest that fills the gap between the rear side of the bed and the hinged bed top. (The seat would then be where the plastic storage box is shown, top left of the montage image). 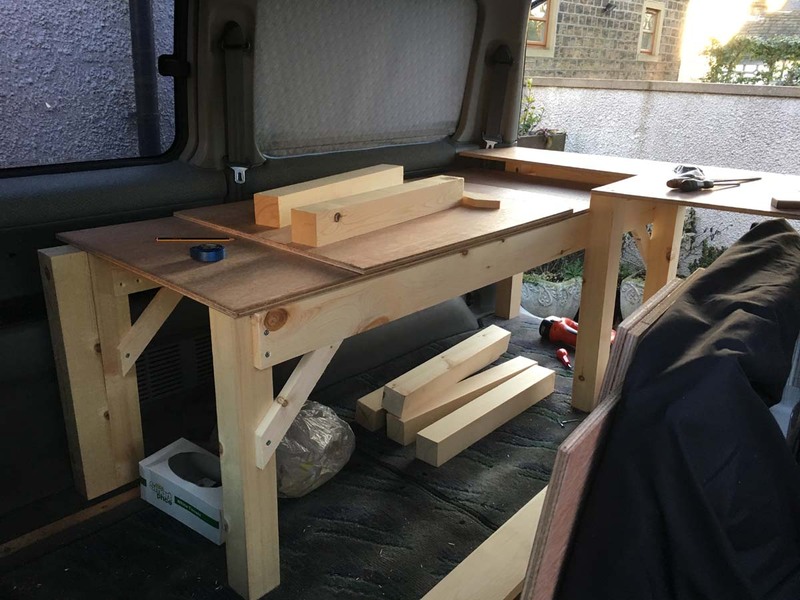 Bed board shown with hinges and in lifted position. 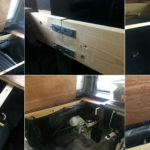 Side is located behind the rear side and secured with a wooden dowel. 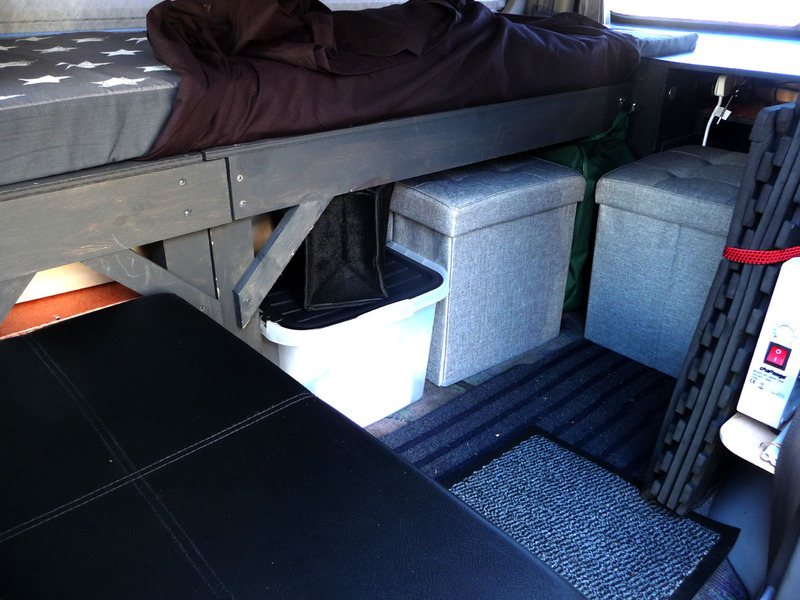 Almost the full width of the van floor area is now available. Two locating pins, at each end of the bed board, prevent movement of the board when it is in the down position. This stops the board from slipping off the front side beam, of the bed.